After many months of design and rigorous testing Forge Motorsport has launched what they claim is the world’s first universal adjustable piston Fuel Pressure Regulator (FPR). Not only is it extremely easy on the eye, gracing any under-bonnet area, but it also solves the issue of using standard regulators on tuned cars – which often can’t cope with the additional demands placed upon them. Using its considerable expertise in the design and use of piston technology, coupled with unparalleled research into the custom manufacture of quadrant Viton® seals, Forge has achieved this unique design. Their new FPR has been designed to cope with the flow rates required over 1000bhp and to complement the innovative design Forge even incorporated a spring manufactured by the masters of coil technology… Eibach! The unit is fully serviceable, with a replaceable piston and low-friction quadrant Viton® seals, and is clearly designed with ease of adjustment in mind. Supplied with two stainless steel mounting brackets it can be mounted in almost any position. Setting up couldn’t be easier, thanks to the fuel pressure gauge that is supplied with the kit, making mapping and initial baseline tuning much quicker and easier. You can also choose from AN-6, AN-8 & AN-10 fittings to be supplied at point of order to making plumbing the unit in a real doddle. 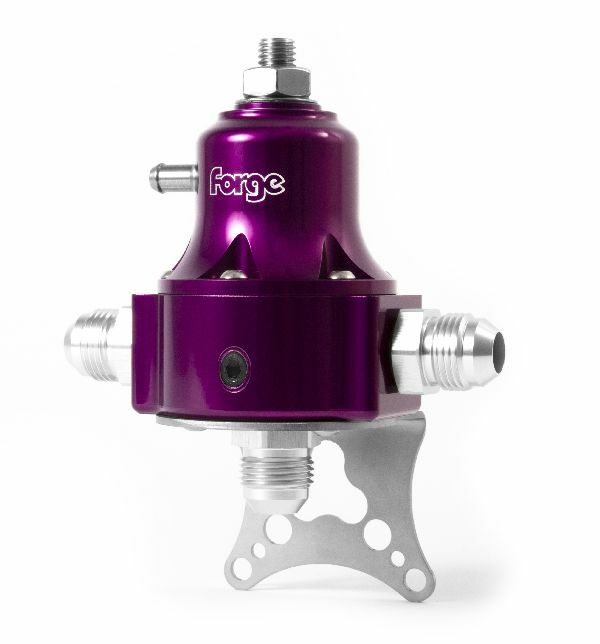 A choice of hard-wearing black or purple anodised finishes can be selected, depending on whether you want a more classic or custom look, and whichever one you choose, the Forge FPR comes with the firm’s industry-leading original purchaser lifetime warranty. The unit is priced at £190 inc VAT with more information from www.forgemotorsport.co.uk ENDS. Print article This entry was posted by admin on January 25, 2019 at 11:07 am, and is filed under News. Follow any responses to this post through RSS 2.0. Both comments and pings are currently closed.